Vito (Malonzo) is the number-one cop on the beat. He wears a cool denim jacket and REO Speedwagon shirt (which would go for big bucks on Ebay if he sold it today) and is handy with a high-powered assault rifle. He's a tough guy but with loving heart for his wife and young son. Vito meets his match when he stumbles upon a crime ring smuggling illegal goods. He shoots and kills the son of the ringleader (the ringleader and main baddie's name is Bono) in self-defense. The gang doesn't take too kindly to this and they kill Vito's wife and later on they shoot his son in the arm. Vito gets suspended from the force, then goes off on his own "Search for Vengeance"! In this Phillipines-lensed actioner, The dubbing alone is uproarious and fully entertaining in its own right. A night of entertainment could be had if you pop in "Search for Vengeance", crank up the sound, and close your eyes. But add to the amazing dub-job a competent action thriller, and you get a great time! Some highlights of the dubbing include: "Rot in Heck!" (we rewound this to make sure), "Dumbbell! ", "I'll see you in court - or in hell - either way you lose! ", and Vito's son, who appears to be ten years old or less, has a voice like a chain-smoking forty-year-old and gravelly proclaims "I don't like candy". Those are just a few choice examples. All the voices are great. In an interesting subplot, Vito becomes a "Filipino Robin Hood", and local folk hero, when he steals from the syndicate and gives to the poor. When the syndicate lies to the townsfolk and tells them Vito has betrayed them, they do the most natural thing: they crucify him and throw stones at him. His son intervenes, showcasing his inner-forty-year-old, and gives a mature speech decrying what they are doing. A movie highlight takes place at the "Ginza Super Club" when a brawl breaks out. A guy at the club has a jacket from "Zale University", and presumably illegally, the song "Beat It" plays, but just the main riff of the song over and over, with no vocals. They must have seen the music video. Can they do that? The signs on the doors at the police station are crudely written, and it shows that this is a police drama from another culture. We see many people that are poor and destitute and living in huts. 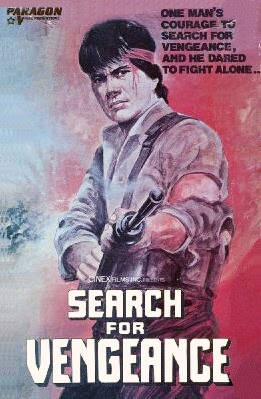 But Vito is a hot-shot cop and rises above all of this to beat up all the baddies with his cool karate moves. Go back to a more innocent time, when you could get a ticking package and no one thought anything of it with this action classic tonight!